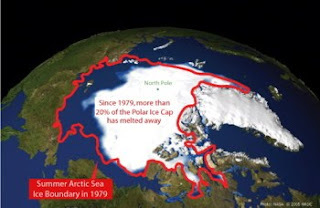 World Wildlife Fund put out a report this week (Arctic Climate Feedbacks: Global Implications), warning that the global impacts of warming in the Arctic will "outstrip predictions." That's a bit of an understatement if (a) you noticed that the 2007 IPCC report didn't include Arctic carbon feedbacks (nor any carbon feedbacks at all), and (b) you've got your eyes open. But as is happening a lot these days, the seriousness of the report is not met with a serious enough response. That's when people get confused. "Hmmm," says the member of the public who doesn't have (or take) the time to find out what's really going on with global climate change, "I keep hearing that it's serious and urgent, but I don't see my government leaders and others who I respect addressing it seriously or urgently. All they do is talk and negotiate." In this case, WWF has partnered with other concerned nongovernmental organizations to come up with A Copenhagen Climate Treaty [pdf], A Proposal for a Copenhagen Agreement by Members of the NGO Community. Now, I'm no mathematical genius, but I know that we can't get to a zero-carbon economy by reducing our emissions by only 80%, even if it's 80% below 1990 levels. We have to cut our emissions by 100%. And by far sooner than 2050. My discomfort is that these well-meaning NGOs will probably defend this position by saying it's what they "realistically" think they can get. But killing the future more slowly than "business as usual" will kill it is still killing the future. And if we know we have to get to zero carbon emissions, why ask for 80% cuts? It's slow suicide. Let's be bold and audacious — and courageous — on behalf of all future generations and ask for what we need to ensure their future: cuts of 100%, and a rapid transition to a renewable energy based, zero carbon economy that will be safer, cleaner, healthier, more equitable and more peaceful than what we've got right now!